NEW DELHI:The finance minister, Arun Jaitly, called a meeting of inter ministry group in the wake of soaring rates of the Pulses in the country. The finance minister informed, " 5000 tons Pulses has been imported and is being distributed; the rates will be controlled within 2-3 days." The government has taken all the necessary steps. "The government stores are selling it on Rs 120/kg", said the FM. 36000 tons of Pulses were recovered from the hoarders' possessions during the raids. the raids are continuously done. The FM declared, "The seized from the hoarders and the imported Pulses will slump the rates in market." 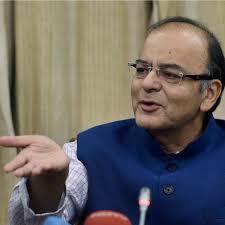 The FM said, "Many states government have decided to bring the pulses stockpile in market. The states government have undertaken the raids like drastic steps against hoarders that it be a message for them." The government released a statement, " The states governments were directed to raid and sudden checking operation to prevent the hoarding. The Pulses in 10 states has been seized 35288 tons in 2704 raids." According to the Union Government, "The Pulses 23,340 tons in Maharashtra; 4525.19 tons in Chhatisgarh; 2546 tons in Telangana; 2295 tons in Madhya Pradesh; 1168 tons in Haryana; 859.8 tons in Andhra Pradesh; 479.6 tons in Karnatka; 68.47 tons in Rajsthan; 4.32 tons in Tamilnadu and 2.44 tons in Himachal Pradesh were seized." The union government has ordered to the State Cooperative Institution of Haryana( HAFED) to buy pulses from market and to sell it from the own stores. Market Commitees of Uttarakhand have opened the retail outlets to sell Rs 145/kg the pulses at Dehradun, Haridwar and Udhamsing Nagar. The state government has been directed to sell the pulses in the scheduled rate in ration shops. The outlets of central storage are selling Daltuar Rs 120/kg in Delhi while the rate of Urad is Rs 30/ kg in Tamilnadu. The government of Andhra and Telangana are distributing red gram at Rs 50/kg to provide the relief.